Bookmark printing lets you leave a mark! Bookmark 48HourPrint.com for high quality bookmark printing at prices you can afford! You can trust our online bookmark printing services for excellent quality and fast results with our industry-leading 48 Hour Turnaround Guarantee for quantities up to 5,000 bookmarks and our 24 Hour Turnaround Guarantee for quantities fewer than 500 bookmarks printed on our digital press. 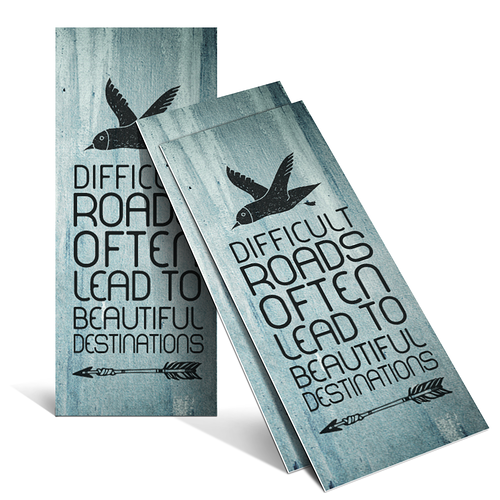 Bookmarks are a universal favorite and display messages in a compact, useful way.Use online bookmark printing from 48HourPrint.com to give your message staying power. As a promotional piece, bookmarks can provide years of service - noting a reader’s place in a new novel or marking a favorite spot in a treasured book or helpful reference manual. Whether your bookmark includes a calendar or inspirational message, announces special events, or simply includes useful tips and facts, bookmark printing is an effective, low-cost way to promote businesses of all sizes, schools, colleges, libraries, bookstores, non-profits and more! Preserving the environment is important to 48HourPrint.com. Our bookmarks are printed on recycled cover stock, which delivers excellent results on cover stock that is brighter and more uniform in color. Recycled cover stock is our standard stock, at no extra cost to you. Our online bookmark printing services include full color both sides on 14 point cover stock, with your choice of gloss coating, high-gloss U.V. coating, C1S (coating on one side) or matte coating. For tips on using promotional bookmarks, check out our bookmark marketing ideas. Also review our bookmark templates for layout guidelines that will help keep your print job on schedule.